The combination of sweet and fat will always be a siren song to the human palate. Nuts and fruits can fulfill this while delivering the components that make them true health foods. With the revamping of the Dietary Guidelines plus increasing emphasis on natural sources of nutritive density and concentrated energy, processors can anticipate growing demand for fruits and nuts in formulations. Nuts are enjoying a strong renaissance now that blanket "fear of fat" has given way to more informed nutrition sense. They continue to gain in health reputation for providing abundant protein and micronutrients in a tiny package replete with healthful oil components. Plus, recent studies connect their consumption with protection from cardiovascular diseases. And consumers are responding eagerly. "Just when you think almond supply is going to exceed demand, demand continues to go up," says Lori Coburn, sales director for Hughson Nut Inc. (www.hughsonnut.com) Hughson, Calif. The recently harvested California almond crop is estimated to reach nearly 2 billion pounds, she says. With this acceptance of nuts as true health foods, nut processors are expanding their portfolios to increase possibilities for inclusion in formulations. According to Coburn, the popularity of almond meals and flours is soaring. It is an economical option that provides almond flavor and nutrition in a form easily incorporated into food formulations. The growing demand, adds Coburn, is international and includes all forms, from in-shell to flours, meals, and even the skins. "All this, because research has shown nuts are healthy and consumers worldwide have responded," she remarks. Pecans are enjoying a particular surge thanks to China. Five years ago, China bought hardly any pecans. In 2009, China bought one-quarter of the U.S. crop, and it's believed that number has only gone up the past two years. Prices have doubled or tripled, but in part due to a drought in parts of the South this summer. Meanwhile, and despite exaggerated attacks on fructose as a sweetener, fruits maintain their reputation as the healthiest form of sweetness. This is due in part to the richness of antioxidant phytochemicals, especially in the dark fruits such as blackberries and blueberries. But the attention paid to the so-called superfruits should not overshadow the benefits of the more humble fruits, such as apples, for example. Apples contain significant amounts of soluble fiber alongside cancer-fighting phytochemicals, and some studies indicate they can help maintain healthy blood-sugar levels. Selah, Wash.-based Treetop Inc.'s (www.treetop.com) line of no-added-sugar apple sauces and organic cider are designed to meet demands for more "whole" properties. Since fruit increases the value of a product, the demand for more convenient ways to use a spectrum of fruits becomes of critical importance. Van Drunen Farms (www.vandrunenfarms.com), Momence, Ill., is an example of a grower and primary processor of culinary, all-natural and functional-food ingredients. The company provides fruit-demanding customers with a number of processing options that maintain the functional ingredients of the fruit. One of the most effective ways of preserving fruit nutrients is freeze drying. During the freeze-drying process, the ice is removed with thawing the frozen product. Under a vacuum, the ice goes directly to water vapor in a process called sublimation. It's similar to how dry ice, which is frozen carbon dioxide, goes directly from solid to gas. Freeze-drying maintains cell structure so that the freeze-dried product retains its color, shape, flavor and nutritional value much like the original raw material. Convergence of the fruit and nut popularity factors spells an increased interest in healthy snacks that include both fruits and nuts. Walnuts and flaxseeds, for example, are favored by consumers as good vegetarian sources of omega-3 fatty acids. Monounsaturated fatty acids, dominant in avocadoes and nuts such as almonds, accompany a trove of vitamins and minerals already inherent in these ingredients. Dried berries are chewy-sweet distillations of antioxidants and fiber. "I started Pure Bar out of necessity," said Veronica Bosgraaf, founder of Newport Beach, Calif.-based Pure Bar (www.thepurebar.com). Pure bars are healthy combinations of fruits, nuts, and other "natural" of "organic" ingredients. "At age 6, my daughter decided to become vegetarian and I was having a hard time finding nutritious packaged snacks to toss into her lunch box," explains Bosgraaf. "This prompted me to experiment with healthy snack options. She and I created Pure Bar keeping in mind the essential nutrients, protein and fiber her growing body needed. After developing different flavors I started bringing the bars to my daughter's school events and family functions. People were impressed with how great they tasted and were shocked when they were told how healthy they were." 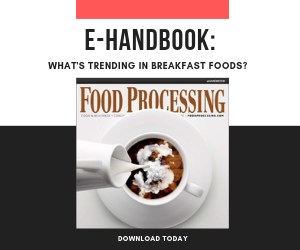 While these classic ingredients will always capture the desire of consumers, and bar and breakfast food makers carry on mainstreaming fruit and nut combos, ingredient makers continue to create and offer multiple formats of each component. Together, all are ensuring these two classes of ingredients are enjoying a beautiful future together.